The Hal Leonard Vocal Sheet Music series is an exciting new series for singers, featuring authentic piano accompaniments and custom guitar chord diagrams, tailored to each song's unique chord progressions and designed to provide realistic support. 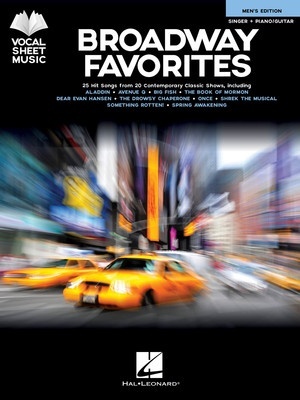 25 songs for men's voices are included in this volume, all from contemporary Broadway classic shows: Aladdin • Avenue Q • Big Fish • The Book of Mormon • Dear Evan Hansen • The Drowsy Chaperone • Once • Shrek the Musical • Something Rotten! • Spring Awakening • and more.